As I have stated before, I live in Portland, Oregon. There is a town near the Portland area called Wilsonville. It's about a fifteen minute drive from where I currently live. When I was growing up I lived in Oregon City. I remember when I was ten or eleven one of my friends told me about a mental hospital in a town called Wilsonville. This was the first I had ever heard of the place (the hospital and the town). My friend told me something had happened there that was in the newspaper. He had overheard his parents talking about it over breakfast that morning. A patient had escaped from his secure room and was running loose around the hospital. The residents scrambled security around the building, trying to locate the man. Apparently there were some patients that needed to be locked up, because they were dangerous to themselves or others. This particular man was one of those patients. He ran down the stairs of the hospital into the basement, where the boiler room and morgue were. Down under the building there was supposedly a maintenance tunnel with easy access to the building's plumbing and electrical lines. That wasn't the principal purpose of the tunnels, however. It was said the tunnels were built as a fallout shelter in the case of major disaster. The longest leg of the tunnel was three quarters of a mile long and resurfaced at a worker rehabilitation center known as the Living Enrichment Center, or LEC. The man was thought to have escaped through the tunnels to the LEC, and was still missing. I thought about that crazy patient, running loose through the woods. This story sent a chilling wave of fear slowly through my body. At the time, the LEC was run by a young charismatic couple. The compound was designed chiefly as a place of healing for troubled people. While it was a lot like a church, it wasn't built around any specific organized religion. The ideas of the place were loosely based around Buddhism and other eastern religions. The main building had a reception lobby and on-site bookstore, connected by a long hallway dotted with small offices. There were kindergarten and grade school classrooms on one side of the building, with a hundred or so lockers outside the doors. There was an indoor pool and locker rooms. 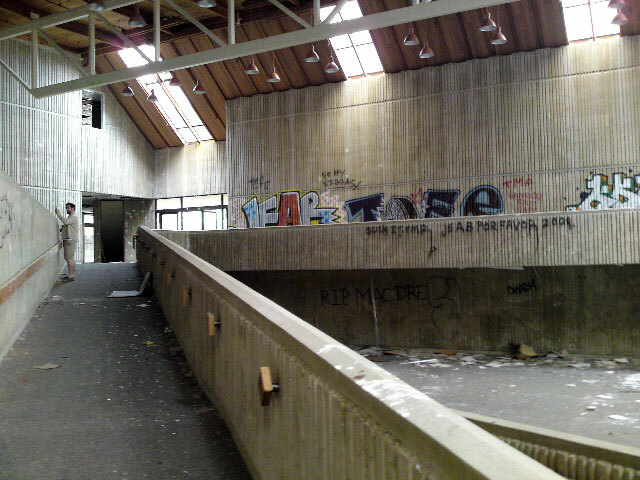 There was also a cafeteria and a big kitchen, next to it a daycare center. On one end of the building there was a huge auditorium with a stage and a balcony. Outside the main building there was a covered walkway that stretched to the other side of the property. There you could stay at one of twenty-so small cabins they used for retreats. There was a small stream of water that ran through the center of the property to a pond, which was surrounded by picnic tables and benches. On the far end of the pond was a wooden gazebo with a round table inside. Most of the time, the LEC was filled with people, several hundred at any given time. The place was active with community servants and volunteers, and for the most part played a role in the rehabilitation and positive outlooks of many people. They held plays and hosted motivational speakers weekly in the auditorium. People took swimming lessons. They threw parties and weekend retreats. My parents even had some friends that visited there from time to time to take a yoga class. I didn't know all these things went on there until I became an adult and did a little research. While the LEC at one time was an important place of inspiration for a lot of people, like many other places, it had a dark past. A few years after the organization took off, the young successful couple that ran the place fell into the cross hairs of the local police. Questions had begun to arise regarding back taxes and unpaid debts. It came into light that they were stealing money, several million dollars. It took a few more years for an actual conviction, but when the case broke open, so did the LEC. The front page of the newspaper suddenly showed the charismatic leaders of the organization being led away from their building in handcuffs. Edward Morrissey was locked away in a federal prison for money laundering. He confessed to their wrongdoings under the condition his wife, Mary Manin Morrissey would not see any jail time. As for their organization, things sort of fell apart from there. Regular activities abruptly halted, and the Living Enrichment Center's gears stopped moving. Betrayed, the members of the organization stopped showing up altogether, and the business itself was finished. The compound immediately shut down and was closed. 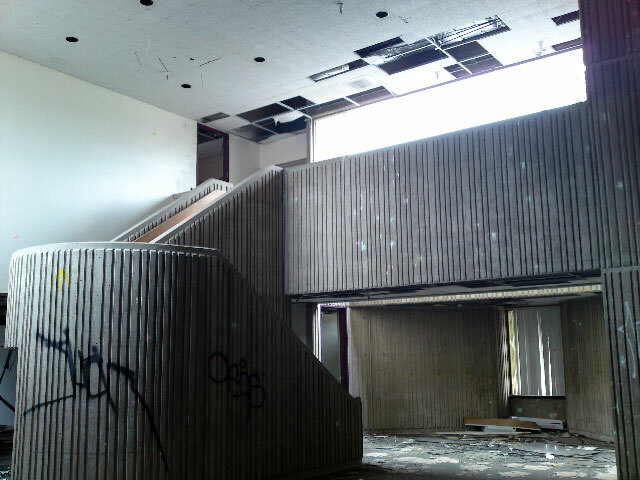 To this day the place is deserted, devoid of people and completely abandoned. When I heard about this place a year ago that familiar feeling of fear crept back into my body as I remember the story my friend told me when I was ten. I began to research the LEC and learned about what I just told you. I talked to my parents about it and they remember the whole thing quite well. They told me everyone was shocked to learn the couple running the place was brought down. Before then they were well-loved. I also looked into the mental hospital. I wanted to know if it was still there and if there really was a tunnel system running underground between the two buildings. I learned that shortly after the LEC shut down the mental hospital coincidentally became abandoned as well, for completely unrelated reasons. 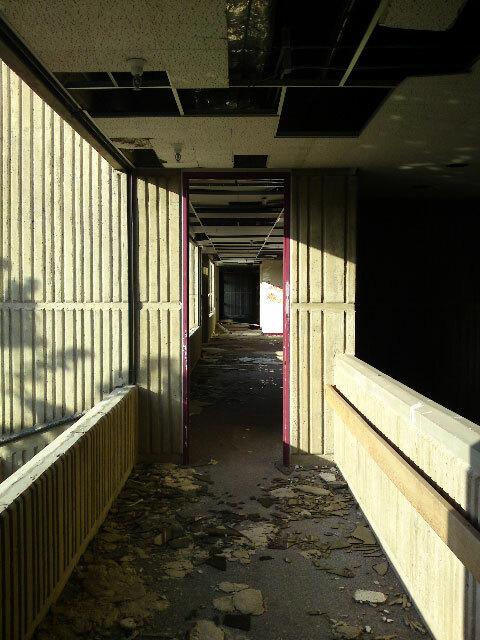 To my dismay however, I also learned the abandoned hospital was torn down a year ago to make way for a new housing development. I found web sites talking about the numerous sightings and paranormal activity recorded at the abandoned hospital and how it was rated one of the most haunted places in Oregon before it was demolished. The opportunity had passed me by... Or so I thought. When I read about the tunnels I could only find rumors about them being there, no real confirmation of their existence. Needless to say I was intrigued. 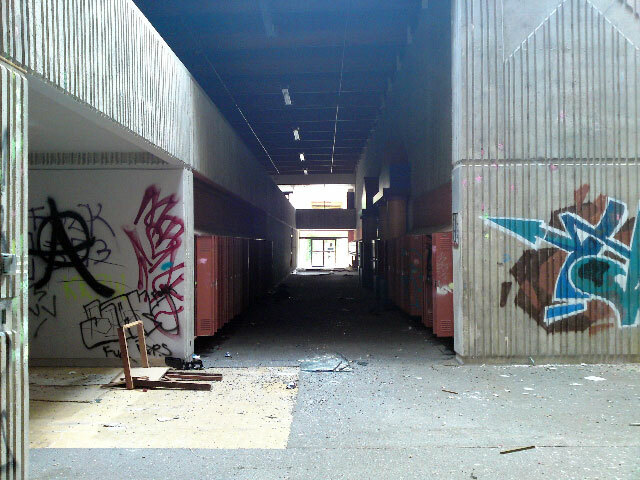 I wondered if the tunnels were there, and if they still lead underneath where the mental hospital used to be. I used Google Street View to find the exact location of the LEC, and I was on my way. I drove to Wilsonville a year ago in July with my friend, who I will call Alex (not his real name). We brought flashlights and a digital camera. The LEC's main entrances had been chained off, and the parking lot could not be used. This was an easy problem to get around. We parked about a half mile away and entered the forest surrounding the compound. When we emerged into a clearing we saw the hulking mass of the 95, 000 square foot main building, covered with ivy and thorny bushes. The whole property was surrounded with chain-link fence. I quickly located a hole someone had cut in the fence. We climbed through and entered the property. To our immediate right was a cluster of dilapidated cabins that stretched for a quarter mile or so. Most of them had collapsed roofs or doors that had been long since kicked in. To the left was the giant concrete building that was once the proud Living Enrichment Center. The place was truly scary looking. It was abandoned, for sure. Alex was getting visibly nervous so I asked him if he would be okay to explore a little. He wanted to leave. I asked if he was sure and after a minute or two he decided to stay. We entered the main building through a shattered glass double doorway. The entire place was a shambles. 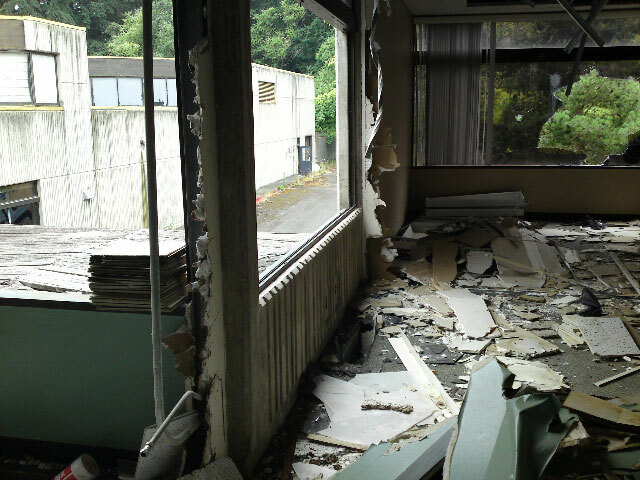 The windows were broken, the walls were spangled with graffiti and the doors for the most part were demolished. The carpeted floor crunched underneath our footsteps with broken glass. There were beer cans and cigarette butts all over the place. It had obviously been used for some serious partying. It was vandalized to the point of condemnation. There were weird stains in the carpet and piles of garbage in some areas. Some folding chairs that had been left behind were crushed and twisted into a strange mass of metal. We walked around the entire building, taking pictures and mostly not talking. We began searching for the tunnels. While we were there it was about 2 in the afternoon, in the middle of July. Despite being a 90 degree day, the LEC was cool and dark inside. We had our flashlights on most of the time. After an hour had gone by we had not found any leads as to the tunnels' whereabouts. If they existed, they were well-hidden. While we searched we eventually got split up. The place was huge after all. I was in an area that looked like it had been used as commons. There were a few tables here and there and a long wheelchair ramp as well as stairs that lead up to the main entrance a floor above. I couldn't see the main floor above me. I was looking for a maintenance door or stairs leading down. I suddenly heard a loud crash on the floor above me. The whole room was open with high ceilings and the sound echoed through the whole building. It sounded like a heavy person had jumped from a high place and landed with a thump on the floor. I froze and listened for footsteps, but there was nothing else. I figured it was Alex messing with me, so I waited to see what he would do next. Nothing happened for a few more seconds so I shouted to Alex to knock it off. Suddenly Alex emerged from a room across the hallway on the same level as me. He asked me what I was shouting about. I grabbed my breath and held it for a moment. What was the noise I heard? We both ran upstairs and there was nothing there! 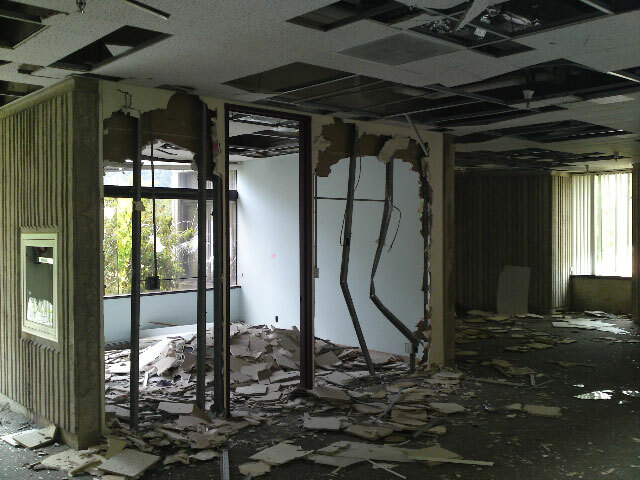 After discussing we decided the place was falling apart so it must've been a piece of the ceiling falling to the floor. While there was no debris anywhere around there, it was all we could come up with. From this point on we decided to stick together. Alex told me he had found a hatch in a dark corner of the building, so we went to go see where it lead. As we approached the hatch I felt a little chill crawling up my spine. I could see the metal trap door, ajar in the next room. The room was pitch black and filled with bulky metal machines. I figured it was a boiler room or a furnace or something like that. 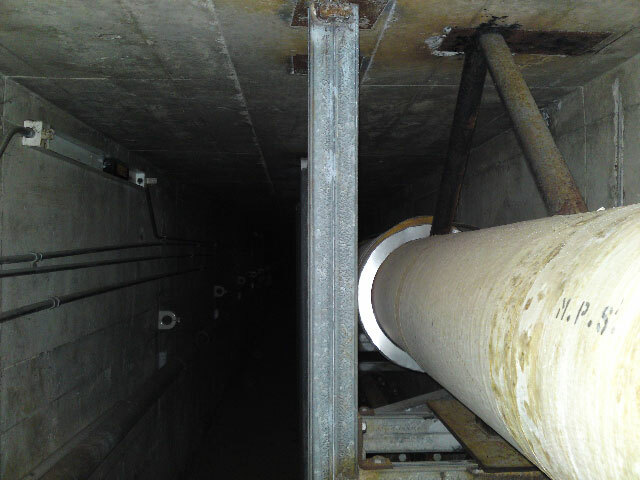 I shined my flashlight down into the hatch and could see it lead down to a tunnel. Someone had left an old wooden ladder in the opening for people to climb down. We weren't the first people to go down there. There was a moment when Alex and I looked at each other as if to say "Who goes first?" I went first. This tunnel was narrow, cold, and made of concrete. Long pipes stretched as far as I could see ahead of us. We walked to the end and surfaced underneath the swimming pool. It was creepy, but not the right tunnel. It obviously didn't lead to a mental hospital. We climbed out and searched for another half hour or so, until we came across a room filled with maintenance equipment. Most of the stuff in there was totally destroyed. There was a pile of broken tools and a wheelbarrow that was rusted through. There was water dripping all over the place and puddles on the ground. I don't know what was in there, but it smelled fetid and rotten. There was a metal staircase leading down into the room, and near the bottom it was twisted and broken. We climbed down the steps and looked around with our flashlights. We didn't find anything at first so we turned to leave, and that's when we found a small narrow passageway underneath the stairs. I could feel a chill breeze coming out of the entrance. I tried not to think about the story my friend had told me when we were kids. This time Alex went first. I could tell immediately this tunnel was different. Air gently passed through the tunnel coming from the other end. While this tunnel seemed longer than the last one we found, it was definitely narrower. I had to walk directly behind Alex, and I couldn't really see over his shoulders very well. At the beginning I was glad he had gone in first, but after a few minutes I was regretting it. I had nothing but darkness stretching endlessly behind me. I kept turning around to shine the light behind me, but after awhile my flashlight couldn't reach the end. We must've walked for ten minutes or so when Alex started to get a little nervous. He shakily asked me if we were getting close to the end and I said I didn't know. It was cool and dry inside the tunnel. A soft breeze was constantly flowing through from the opposite end. I looked behind us again and saw nothing but darkness. It was the same ahead of us. I looked at the thick pipes that stretched as far as we could see and there was a huge pressure gauge embedded within. I looked at the needle which was displaying no pressure. It was then I first heard the noise. It sounded like somebody was shuffling their feet. It echoed towards us from the end we came from originally. I thought it was Alex but it was coming from behind us. I shined my light and saw nothing. The shuffle became rhythmic footsteps, then started to sound like heavy footfalls. It sounded like someone was coming towards us. Instinctively I shoved Alex from behind. "Let's go!" I said frantically and we both started to run. Our heavy breaths and footsteps drowned out the other sounds quickly. We ran for what seemed like forever until we reached a t-shaped intersection. From the left we could see sunlight a bit further ahead, and the right was black. We waited for a few moments to listen for anything. We were both panting but trying not to make any noise. Suddenly Alex grabbed my arm and put his other hand over my mouth. We could hear distant footsteps again, this time sporadically, like someone creeping or limping along. After three or four slow steps I heard someone say "SHHHHHHH!" from the darkness. I thought I was going into shock. I was flooded with adrenaline. We turned and ran to the left, towards the sunlight. We found a concrete staircase that lead to a dilapidated outbuilding on the edge of the LEC property, in the woods. We emerged into the bright afternoon. Even in broad daylight I could feel myself shaking with fear. We waited for fifteen minutes for someone to come out of the tunnel, but nobody ever came out. We even came back to the exit and shouted into the tunnel, which yielded no response. On the way home we debated the chance that someone else was in there with us, but it seemed very unlikely. I have read about squatters and tweakers taking refuge in the LEC, but after being there searching for a couple hours we saw no evidence of anyone being there. We have since been back but I'll leave that story for another time. Please check out the pictures I have included with this story. Any thoughts or comments would be appreciated. I live 15 minutes from this place. Let me know if you are going to go back. I will go with you. I would like to further investigate the tunnels. To Explorer. The big metal plate at the bottom of those stairs is the entrance to the tunnel which goes beneath the center and under the swimming pool. The entrance to the other tunnel is sealed off. I have heard there are other entrances, but they are away from the main building, to the North side of the property. The big tunnel is not located in the main building. I hear it is sealed up and is somewhere in one of the buildings near where the caretaker currently lives. I have heard there may be a hidden entrance somewhere which still gives access. Hey I was at LEC today. I had also heard of the tunnel system that lead a mile or so from under LEC to an asylum. I was able to locate the short tunnel that lead to under the swimming pool but had no luck finding any others. Those who have been there, please help me find it. Tips, directions, reference points, landmarks, etc. I am determined to find the tunnel. I searched for a long time but could only find the one. This was very short and only went to the pool, nowhere else. I've heard about an old lady who escaped from Dammasch Hospital back in the 1970's. They used to send the aides out to look for people who'd escaped from there. They couldn't find her for a long time. She was eventually discovered dead from exposure in the trees on the opposite side of the road from the LEC. A few years later, a guy who'd been down in the woods near there, smoking dope--was visited by this woman. She was trying to say something to him. That man knocked at the door of one of the houses along Grahams Ferry Road, to ask that person if anyone had died nearby. He then told her about his experience. Part of the spooky history of the LEC and surrounding lands. Maybe it's April Fools:3 I've already been fooled once, today... Maybe the YGS team just decided to confuse us! Stranger and stranger. It appears I'm not allowed to use the other word for apparitions in my comments--the website keeps turning that word into other words...wow! The building is now owned by several people. Someone finally cares about what happens to this wonderful property with its rare architecture and design. Sad thing, though, they demolished the little triangle building and the giant outdoor brick fireplace. They've also removed the roofing of the sky bridge--this, because of vandals who have broken every window in the place, and have put up wire fences at the end of the skybridge. The walls are mostly gone, as well as the children's area--it's just huge gymnasium sized rooms now. Piles of debris look like mountains in these cavernous areas. A new development for anyone who might decide to visit this building. It there are new owners who are cleaning it up. The LEC is abandoned no longer--there are hidden cameras, a fill-time caretaker who lives on the property, as well as a constant police presence. You'll need permission from the owners before visiting the LEC. If you don't have it, you will likely be arrested for trespassing. As for ghosts? Yes, they still walk the echoing halls and empty rooms of this place. I've heard of an old man holding a candle or lantern, seen there quite often. There's also a lady with white hair who likes to appear at the tops of the stairways. I've heard stories of people being terrorized by a dark figure wearing black robes. It has long hair and makes this weird sound. If the police don't get you--it is possible these apparitions will. In one of the buildings on the second floor is a bridge to another building, and one of the things that had weirded me out, was that there was a broken down fireplace on the second and first floor of this separate building. I also realize something after reading this. When I was walking along the road, there were these random cement "courts" that I thought was maybe something for basket ball or some other games, was where these cabins stood. Only after reading about the cabins did I realize it was so. Its amazing how so much has changed in the two years between your and my visit, and how much has also changed between the six years of this place shutting down. LECexplorer: Thanks so much for the interest in my post. I have been to the LEC several times and there is always something there that surprises me... Like the fact that there is a lot of stuff still there (furniture, precious metals, etc), despite the concentration of squatters and meth heads that are known to hang out in the area. I found a huge cupboard full of dishes and glasses (I think the same one you were talking about) as well as stacks and stacks of blueprints to various areas of the LEC and surrounding properties. I saw the blueprints in the building in the second to last picture like you were talking about, and I actually do remember seeing the heavy-duty lock on the women's bathroom. In that same building, did you notice that there is a huge steel double-door near the back that is completely welded shut? I wonder where it leads? With enough determination, one might locate a blueprint to that particular area and might be able to pinpoint exactly what lies on the other side. It might just lead outside, I am not entirely sure. It makes me a little squeamish nonetheless. I am pretty impressed you found the tunnels with those blueprints! I tried to decipher a few and gave up quickly. By the way, I think I remember seeing that area you were talking about with the upstairs rooms. I don't remember if I tried to get up there or not but if I go back I'll let you know if I can figure out how to get there. I did get on the roof more than once and I can remember seeing many rooms below looking through the many skylights... It might be a play to start looking you know? Hey just wanted to comment on your post... Great post btw... I went to church there for years and was also in the very first classes at the school a few friends and I actually named the place christofori after the piano man and the staff liked it so it stuck... It wasn't a quote un quote compound or cult or anything like that the church was a regular church mainly christian with influences from ALL other religions hense all the statues of other gods around the 95 acres (which I'm sure are over grown now) I haven't been since it was closed I've been outta state for a few years but I've been all over the lands and all over every building and can tell you what each area/room was for while it was open... LEC itself is not a creepy place and while open nothing bad ever happened... Except the time I stepped on a undergroud yellow jacket nest lol... But yes there where creepy places even while the place was up and running... And I have seen the tunnels you have talked about here... And I think the other one is outside the main entrance (where it says living enrichment center) or at least it used to say that... You should hear running water even with the place closed up there is some kind of either grate or metal door things somewhere right there and I'm pretty sure that's the main one... But careful most the other tunnels are a huge maze id love to see more pictures and I'm also trying to figure out if there is still a tree sculpture on the wall to the left of the kind of spiral stairs? Again any questions on rooms or areas let me know! And id love to see pics of it... Even though its sad to see what that place has turned into it was amazing when it was up and running! It's weird, that second to the last picture you have, of the outbuilding, is FILLED with a lot of useful stuff. Expensive HPS bulbs, electrical supplies, perfectly good and surprisingly clean fancy glasses, for brandy or something I'm assuming. Tons of stuff in there, its really surprising all the meth heads I'm sure go there haven't cleared everything out already. If you wish to do further tunnel exploring, a little tip. If you go in the same building I was just talking about, your second to the last picture, just as you enter the building go to your direct LEFT and go all the way to the end of the building. There are TONS AND TONS of blueprints in a cabinet that have the layout for the tunnels. One weird thing about that building, there is a mens and womens bathroom, but the womens bathroom has a huge super heavy duty added-on lock on it, that only locks from the outside, like they were locking people in there or something. Pretty strange. There is also a small room/area on a top floor, high above the main upstairs area that has windows that looks into the main commons area you have pictured in pic number 4. I THINK it would be behind you from the angle you were taking the picture from, its not that single window up high in the pic. From what I could tell it looked to be intact, as if not many if any people had been up there. Looking around for hours we could find absolutely no way to get up there, which is why I was looking through all the blueprints in the first place trying to locate a stairwell or something, with no luck. But that's when I did find the blueprints for the tunnel, which sparked my interest to explore those. Check my other stories. I have posted a second LEC trip story to my profile. Thanks for reading. Fascinating stuff. What happened to Part 2 of this story? I want to hear about the return visit you alluded to! Some say that the photos of orbs and shadows are the scariest on this site, but after seeing these photos I feel I've found something far creepier than shadows. The feel you get from your story makes it seem like you're almost there and then you supply us with pictures, now it's as if you really are there. I shuddered when I looked at the pictures, you can see just how quickly downhill this place went. The metal is twisted in places and it seems someone used the area in photo 5 for a paintball course. Good job writing this one. I can't wait to read your other stories! 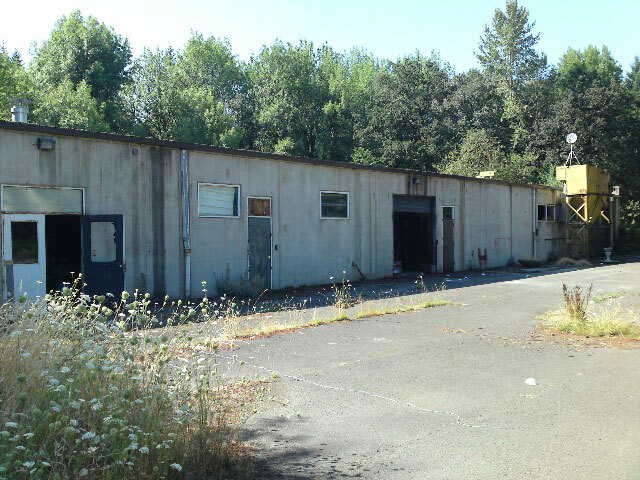 I spent my childhood in Milwaukie, I'm frankly dissapointed I didn't get to explore this place myself. Being a wizard now stuck in Cheyenne, WY, there aren't many opprotunties like this one. I hope to return to explore these ruins myself. Looking forward to LEC2! © The ghost story Living Enrichment Center is copyrighted to mrdeagle. Edited by yourghoststories.com.